William W Wheeler was a self-made man from St. Joseph, Missouri. He represented the possibilities of the Gilded Age. Rising from very humble beginnings, Wheeler worked his way from bookkeeper to president of what was considered the largest mercantile company west of New York. Similar to so many other Gilded Age millionaires, Wheeler and his family enjoyed getting away from their home city to winter in Miami. Wheeler was a frequent visitor of Miami many years before deciding to build his home on Brickell Avenue. This article is the second in a series on homes featured in a 1948 aerial picture of Brickell’s Millionaire Row. The photo features just a few of the mansions residing on Brickell Avenue between Fifteenth and Twenty-Fifth Roads. Although most of the mansions are gone, the stories of the families that built them provide a glimpse into an area that featured so many prominent homes. 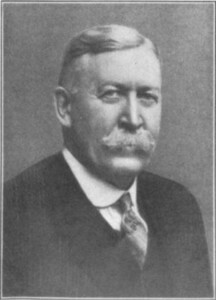 William W. Wheeler was born in Ohio in 1845. He was the son of a farmer and grew up as a farm boy. Wheeler got his advanced education at the Conneaut Academy in Conneaut, Ohio. He began his career as a clerk for a railroad company in Tennessee. Wheeler moved to St. Joseph, Missouri in 1872 to work for Tootle, Craig and Company. The company was a regional wholesaler of dry goods. The company began in 1849 when Milton Tootle decided to shift his small dry goods retail establishment into a wholesale company. Wheeler began his career as a bookkeeper and earned the respect of the founder Milton Tootle. After a few years of working for the company, Wheeler was promoted to General Manager. Following the death of Tootle in 1892, Wheeler was promoted to president. The company name was expanded to Tootle-Wheeler-Motter Mercantile Company. The name of the company changed once more in 1909 when it incorporated and became Wheeler-Motter Mercantile Company. 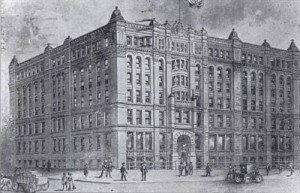 Under Wheeler’s leadership, the business expanded and grew significantly. Revenue for Wheeler-Motter grew from $700,000, when Wheeler took over as president, to over $12 million by 1920. By the time Wheeler decided to build his home on Brickell Avenue, his business success was established. Prior to building his mansion on Brickell Avenue, Wheeler and family were regular visitors to Miami during the winter months. In his obituary, published in the Miami Herald, it was stated that Wheeler had been a “regular visitor for many winter seasons”. However, despite traveling to the area for many winters, it wasn’t until 1919 that Wheeler decided to build his home on Brickell Avenue. Many residents on Millionaire’s Row not only built fine homes that uniquely captured the elegance of the area, but also chose to provide a grandiose name to capture the spirit of the times. The Wheeler home was no different. William W. Wheeler named his home “Palm Court”. The home was built close to the bay on a rather long lot. 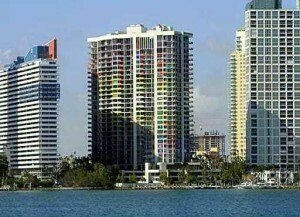 The Wheeler property extended from Brickell Avenue all the way to Biscayne Bay. The home featured a long driveway that culminated with a circular roundabout at the front of the home. Landscaping for the home featured natural pinewood along with large palm trees. In the back of the home, there was a long straight path that provided access to the bay. Palm Court was a three story masonry home with a barrel tile roof. The property also featured a guest house that may have been used as servant’s quarters. Palm Court is the second home from the right in the picture labeled Figure 1. By the time that the Wheeler’s moved into their Brickell home, William was seventy five years old. He was still very active in his business. He and his wife also loved to travel. William authored a number of books based on his experiences traveling the world. Some of the titles of his books include: “Three months in Foreign Lands” (1905), “A Glimpse of the Pacific Isles” (1907), “Discoveries in South American and West Indies” (1911), “Encircling the Globe” (1910), “Our Holiday in Africa” (1912), and “The Other Side of Earth” (1913). Shortly after celebrating his 80th birthday in 1925, the Wheelers traveled to Baltimore. It isn’t known if Wheeler’s trip to Baltimore was for planned, or emergency, surgery. However, William W. Wheeler died during the operation on June 8, 1925. He was survived by his wife, Helen, and his two children. He had a son and a daughter. Despite his age, William’s friends were surprised by his passing. EW Howe, a friend of Wheelers who attended his eightieth birthday celebration, said William “was the most unusual man, physically, he had ever seen”. Howe went on to say that he told William that “he was the best preserved man I have ever seen”, during the night of his birthday celebration. All of Wheeler’s business contacts and friends considered him to be a man of high character and a very capable businessman. William Wheeler’s son, William Jr., continued to work at Wheeler-Motter Mercantile Company following his father’s death. The company would remain in business until 1930. However, according to the Polk City Directory, the Wheeler family did not continue to live in Palm Court much longer following the patriarch’s death in 1925. Some of the other prominent residents of Palm Court included: Burr S. Potter (early 1930s), Arthur R. Rogers (mid 1930s – early 1940s), and Lewis M. Adams (mid 1940s – 1967). Burr S. Potter was a partner in one of Miami’s earliest real estate organizations. The Model Land Company was formed in 1896 and handled the real estate interests for the FEC Railway. Frank J Pepper succeeded Frederick Morse as the agent for the Model Land Company in 1910. Following the death of Morse in 1920, Pepper partnered with Burr S. Potter. Potter and Pepper were the official sales agents for the Model Land Company and had a big influence in the development of Miami in the first half of the twentieth century. Arthur R. Rogers was a prominent businessman from Wisconsin. He held an executive position with C.A. Smith Lumber Company, as well as, President of Rogers Lumber Company. Roger’s business interests were extensive in the lumber industry, which were primarily located in the Midwestern United States. Rogers was in his early seventies when he purchased Palm Court on Brickell Avenue. Lewis M Adams built his fortune as a publishing giant in New York and Tennessee. He established the Hoagland-Adams Company in New York in 1900, the Kingsport-Tenn Press in 1923 and the Colonial Press in 1931. At the time of his death, a couple of the companies he founded were two of the largest book manufacturing operations in the nation. He died of natural causes in Palm Court on October 27, 1967. Palm Court would continue to remain at 1597 Brickell Avenue into the 1970s. Similar to the Villa Regina mansion, Palm Court was razed to make room for the Villa Regina Condominiums. The condominium complex was completed in 1982. The next article in this series will discuss the two homes just south (left in Figure 1), of Palm Court. The home next door to Wheeler’s was built in the late 1930s. The mansion that was two doors south of Palm Court was built by Dr. James Jackson and was known as Homewood. Book: The National Cyclopaedia of American Biography “William W Wheeler”. Figure 1: Aerial view of Millionaire’s Row. Courtesy of Arva Parks McCabe via Brickell Homeowners Association web site. Figure 2: Wheeler-Motter Mercantile Building in St Joseph, Missouri. Figure 4: Headline in Miami Herald on June 19, 1925. Figure 5: Villa Regina Condominiums. Courtesy of Miami Condo HQ. 1 Comment on "Brickell’s Millionaire Row – Palm Court"